Remember the saying, “Calgon, take me away!” I feel like I still say that often. 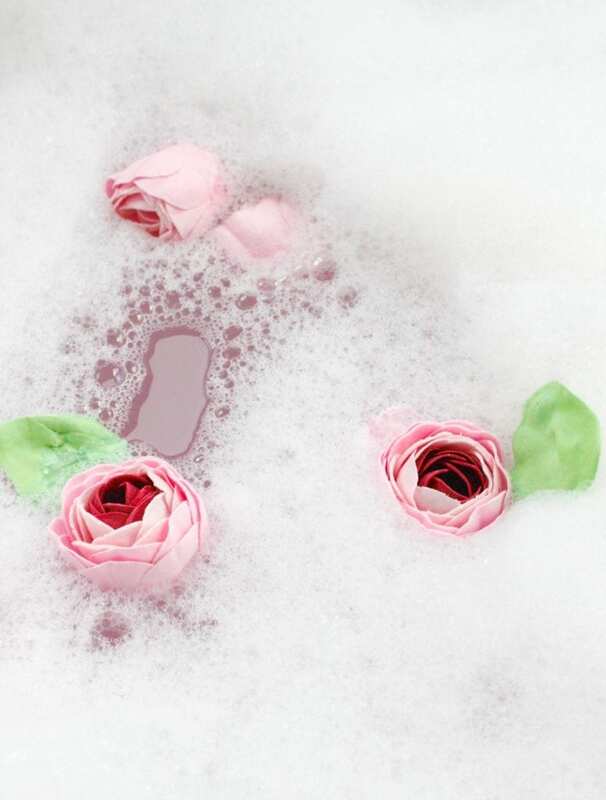 There’s nothing like a hot bubble bath for relaxing and unwinding after a long day. I’ve always loved the way I feel when I go to a spa for a massage, saunas, steam rooms, and in the hot spas and aromatic showers. We may not have the luxury of doing that as often as we’d like, or at all for some. 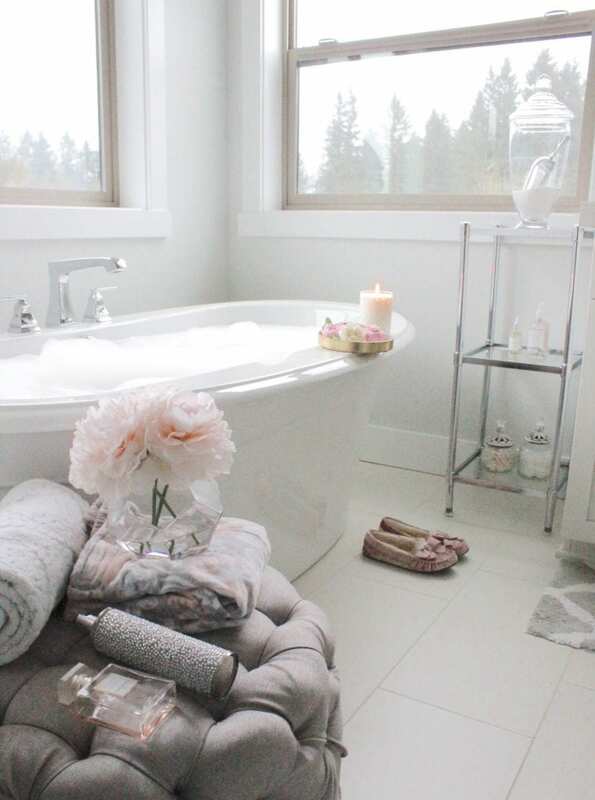 BUT, you can certainly turn your home bath into a pampering session and I’m going to share with you how to create the perfect bath experience at home with a few easy tips. I can’t believe we’ve been in our home for almost 6 months now. 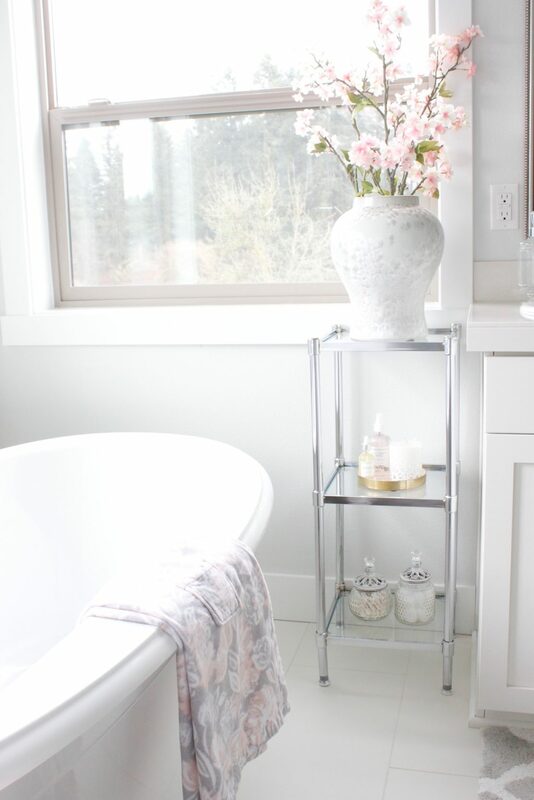 I recently shared our master bath reveal HERE and you can read that post for all the details and sources. I love our view of the wetland and tall trees behind our home and the farm next to us with beautiful horses running around all day. I can sit here in this tub and watch the sunset at night and it’s quite magical and relaxing. If you are designing and building your home, be mindful of the location of your master bath and the direction it’s facing for the ultimate experience. We also love our large windows with no blinds. It allows a lot of natural light to flow in and also allow us to watch the sunsets. Having a bath caddy is a MUST! 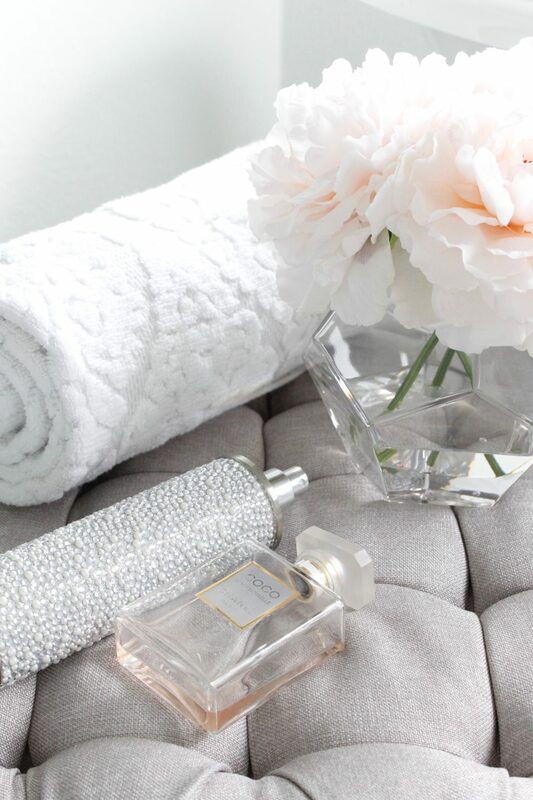 You can put your favorite bath essentials there. I have body oil and rosewater spray on mine but you can put lotions and bubble bath soap on there too. 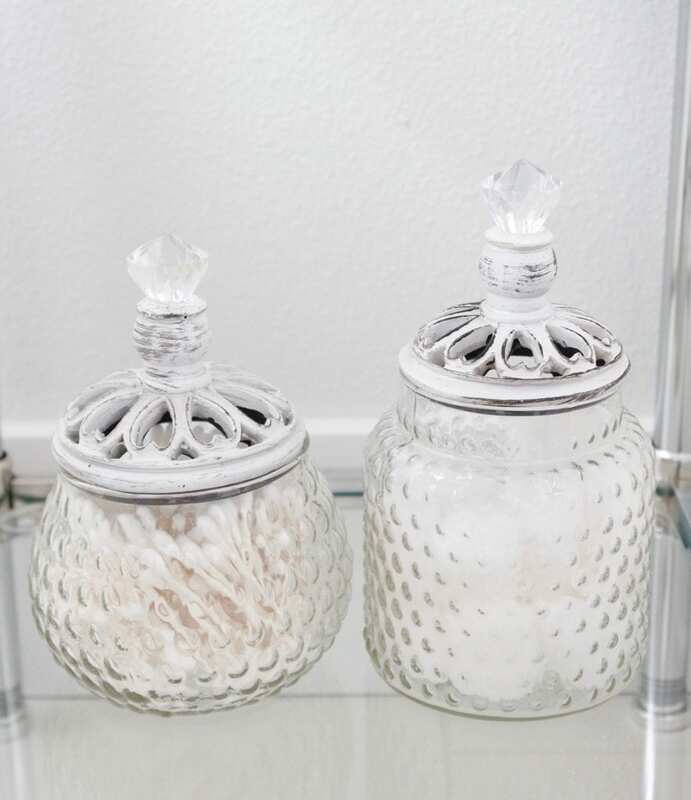 It can hold your cotton balls and Q-tips, decor, rolled towels, candles, and more! Bath salts are a MUST for baths. Once or twice a week I will have a “detox bath” with spearmint & eucalyptus epsom salts and baking soda. Read more about that in THIS POST. It also has magnesium which is so good for you and so your body just soaks it up. Another plus is that it has such a lovely and relaxing aromatic effect, just as a day spa would. I also love having this tufted ottoman next to my bathtub so that I can set my phone there or a tray of something cold to drink. I also have a towel and robe and any lotions or perfumes ready to go. While I love love love a good bubble bath, I also love bath bombs. 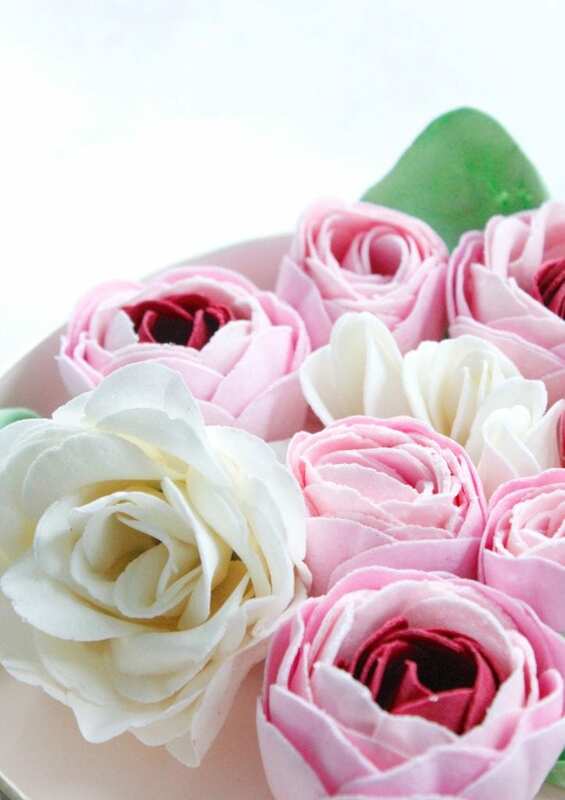 I found something similar the other day at Michaels (random) and they are bath flowers. It was such a pretty set and smelled good so I grabbed them. 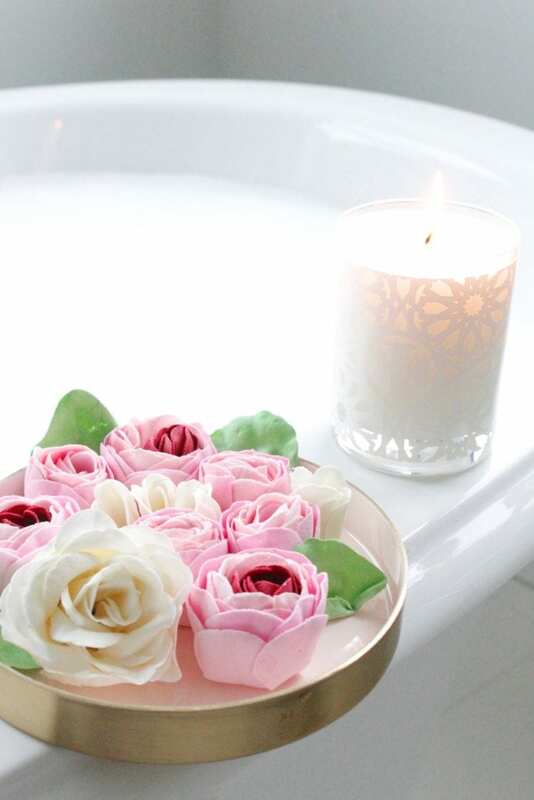 Putting them on top of my bath bubbles of a pink bubble bath just looked perfectly delightful and inviting! 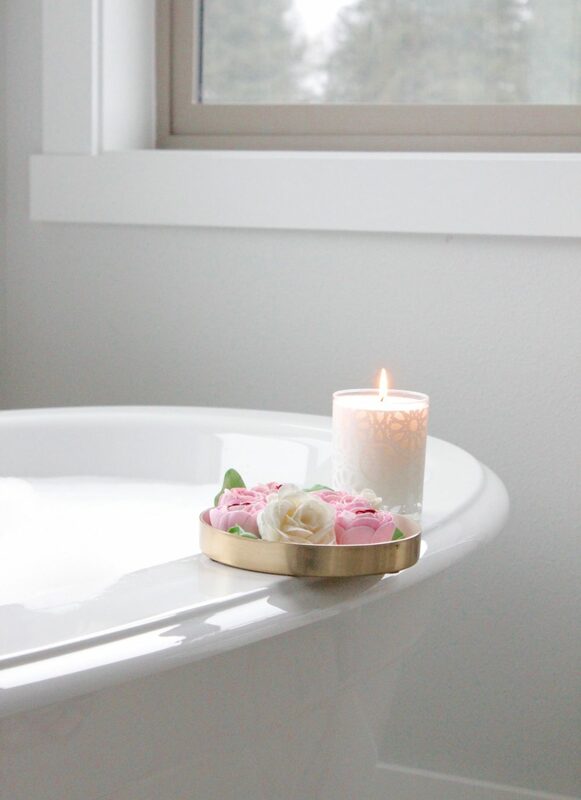 Of course, a luxurious bath isn’t complete without a fabulous-smelling candle that just makes you melt into the bubbles. The only thing missing is music BUT I have lots of relaxing music on my phone under “Bath Playlist”. I still have Enya on my playlist because 25 years later I still think it’s the perfect bath relaxation music. Soft R&B hits, ballads, classical music, meditation music…they’re all good ideas as well. I may have some songs that sound especially good with my master bath acoustics and I belt them out at the top of my lungs. In my head, I sound like Kelly Clarkson but I know my family might beg to differ….haha! When the sun goes down this is the perfect place to be, as I can see it through these windows. You might also spot some deer, jack rabbits, coyotes and other wildlife. It’s spectacular! While I love robes and own many that I adore, I also love a bath towel wrap with velcro. If I know I’m getting ready for the day right and just took a bath after going to the gym and I’m still feeling a little hot, I like to put this on to stay nice and cool and get ready so that I’m not sweating in a robe. Pretty slippers are a MUST as well and I have quite the collection because I wear them all at different times of the year and with different robes. I love feeling pretty in a robe and slippers and fresh after a bath. That’s a LUXURY all on its own! I’m sure every mom knows what I mean! 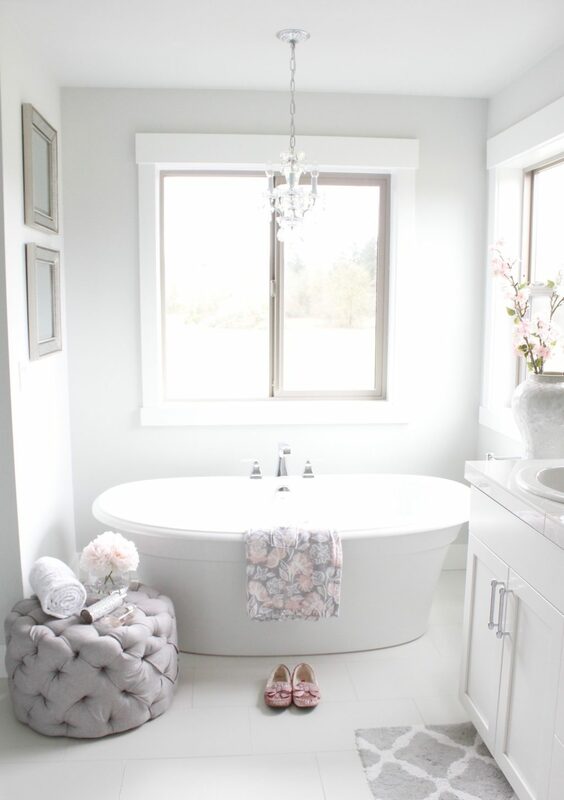 My new bath mat showed up today and I’m thrilled to add a bit more blush to our master bath. And it never hurts to have a sweet greeting like this one as you’re entering (or exiting) the bath. You may only see the bottom of this robe but it’s one of my favorites and you can see more of it in THIS POST where Brooklyn and I have matching robes (back in our Dallas home). A pretty chandelier like this one is always the icing on a cake. It helps create a feeling of luxury and makes you feel like a queen! No matter what kind of master bathroom you have, even if you have the tiniest little bath, you can certainly implement some of my tips to help you feel more relaxed and to have a more luxurious and spa-like experience right your very own home. 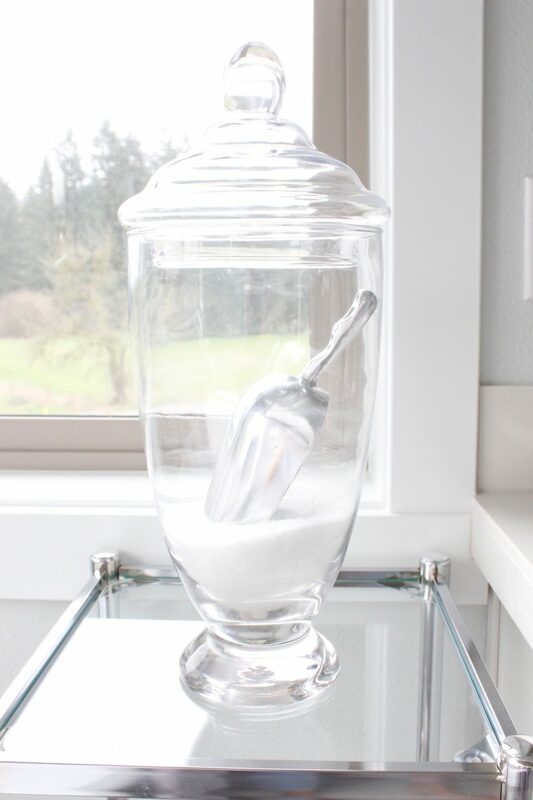 Below are some items from this post and other suggested items, for your shopping convenience! Click on right and left arrow buttons to scroll through items. Click on item picture to shop! Love your home ! I see that the rest of your home is mostly gold hardware/lighting but here it’s nickel. Any tips on mixing gold and nickel for lighting fixtures in an open area ? Or do you think that’s a no ? Hi Jess! Yes, I looooove mixing metals! There’s no rule….just do it! I love that look! You can find a variety of accents to use when you’re shopping online or in a store with the silvers and golds to really stand out. I do, however, like for all my lighting to be one color (either gold or silver-based) for a nice flow and cohesion of the space. But all your accents and even hardware can be different. OMG, I love your bathroom. A DREAM bathroom for sure. I was wondering were you got your bathtub. 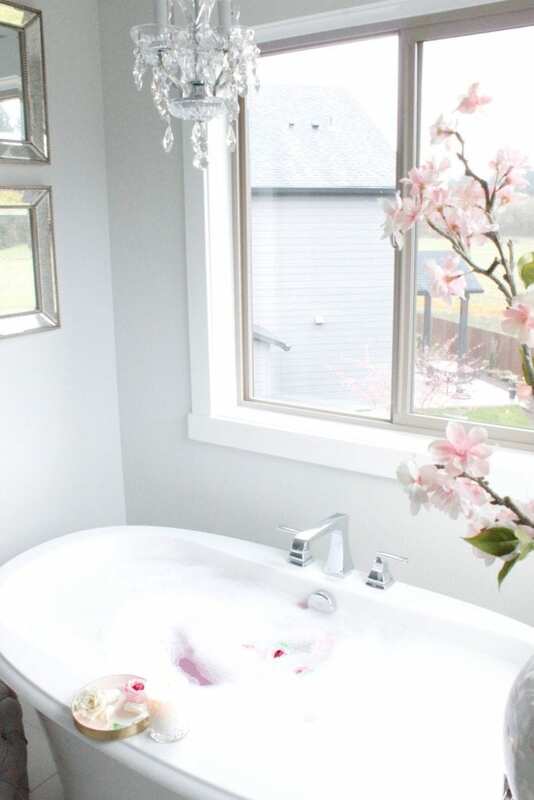 My husband and plan on one day remodeling our bathroom and I want to get a tub just like this. I look forward to hearing back from you.